Monthly software reviews and hardware reivews for business owners, parents and educators since 1995. We also review foreign language learning programs, Youtube Channel Help, TurboTax, DJI Phantom quadcopters & some computers & electronics. Publishers and titles include Adobe Photoshop CS6, Adobe Dreamweaver CS6, Microsoft Office 2010, Rosetta Stone, Knowledge Adventure (Davidson) & more. HB. Note: some of our product reviews will appear on Amazon.com. It’s that time again, at least in the USA, and I mean tax time. It’s seems that after I file our income tax, the next year just rolls around and it’s time to file again. Fortunately, for the past 19 years I’ve been lucky to have Turbo, my trusty TurboTax accountant at my side. Turbo’s been my best financial friend for years. And, I’ve been depending on Turbo’s expertise, and so far it’s been a delight. Prior to finding TurboTax, I was working on my taxes, with pen, paper and calculator, and I have never looked back. What used to take me about 10 days working on my kitchen table, takes me about 2 days and I don’t worry about math mistakes. Besides, Intuit guarantees their work. Now, using TurboTax hasn’t been all rosy because I’ve run into problems that require a real intervention. But, the fix is usually very fast once you search within TurboTax, to find the answer. I have to mention one incident this tax year that made me very impressed with the TurboTax telephone support. Before installing the software I wanted to find out if I could transfer my personal data from my 2016 TurboTax return file, since I had a hard disk failure in December and lost my 2017 files. First, I checked the Website, and couldn’t find the answer. So, I requested phone support, and was given a phone number and reference number. The support person answered all my questions, and I didn’t have to show proof of purchase. I found that it would not load the 2016 file, and I would have re-enter my personal information starting from scratch. I prefer disk programs installed in my computer, and though TurboTax is available online, but I’d rather have all the data in my home computer. Since I run a small mail order business, I get TurboTax Home & Business. Installation from disc was fast: about 5 minutes, but allow a few more minutes to enter your name and register the software. That’s required. When it first runs, it will likely require and online update, and that added a few more minutes. That’s it, and you’re ready to go. The main screen looked very much like the previous year’s version. To begin, you can have it search for last year’s tax data files on your computer, if you used TurboTax for 2017. You can also skip that and just start entering your data from scratch. Once you’re done with registration, you’ll enter your personal data beginning with your name and then start your taxes. You can have them ask you questions, in a step-by-step approach to data entry, or you pick the sections to work within the categories. And, if you’re curious, you can switch to the tax forms to see where the data is going. You may need to switch to the form’s view when you’re done entering all your tax data, after it checks for errors on you return. You can make the corrections directly on the form in question. Note, when entering into your return, you have the option to file an extension to delay submitting your return, and also file an amended return if required because you received tax information late or you found an error. After your personal info is entered, date of birth, social security number, address, dependents, etc, you’ll go on to the next section. 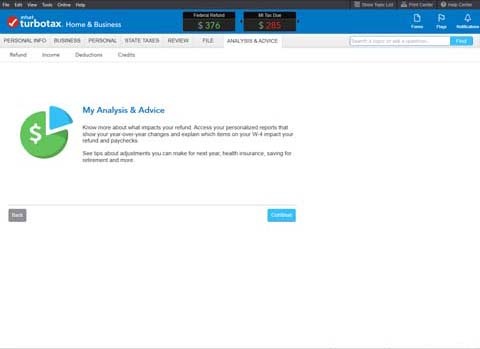 In Home & Business, they start with questions about your business income and expenses. Next, you’ll go into the Personal section were you work through your Personal Income, Deductions & Credits, Health Insurance, Other Tax Situation, Federal Review and Smart Check (for errors). Since Home & Business includes a state return, you can go on to our state, or save your return, and take a break. TurboTax will automatically save your return at times, but I save my return usually before TurboTax does, just to play it data safe. 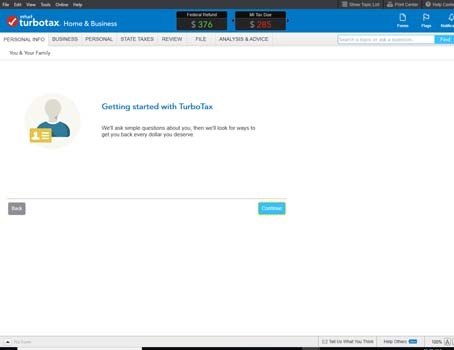 As you’re answering the questions and entering amounts, TurboTax is very thorough and clear as you go from section to section, often with information about the question to help you decide the right answer or amount. However, a few questions though explained within the page, just didn’t help me with the entry. So, never fear, because on every page at the top is a box where you can enter your questions. It will open a small window within the page with links related to that question, and answers. Pick the question that in close to your question and your answer will be there. I had to use the search box a few times during my data entry, and the exact question I was asking was listed, and then I knew how to enter that in my return. Problem solved! But, when questions arise, it breaks my concentration, and slows my progress, but those questions need to be answered correctly. I was very impressed with this option. Though, it didn’t work all the time. After I was done with my return, and doing a smart check, it found an error requesting the Michigan ID on one form. I switched to the form, and the boxes for the ID were empty, so I tried to enter the Michigan tax ID number but it wouldn’t accept numbers. That was frustrating. Well, it turns out that it required the letters “MI” added to the boxes, and it fixed it. However, TurboTax knew I was doing my Michigan return, and the software should have entered the MI on its own. It was a minor problem, though. When you’re done entering your income with the maximum deductions allowed, and no errors are found, you’re ready to file. 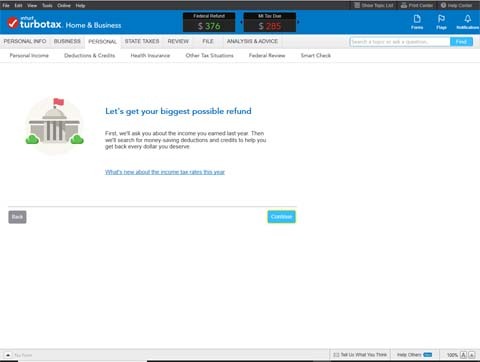 TurboTax allows you to eFile you Federal return for free, and state returns cost $24.95. This year I chose to eFile my Federal return, but mail in the state. Before, or after you eFile, you can, and should print out a copy of your returns for your records and also save a PDF of the return. You can print out just the forms needed to file, or print out the forms with the worksheets. I only print the forms, and save a PDF of the file. It’s important to know that before you can eFile, you must have a pin number assigned to you by the IRS to send it. Also, once you eFile, TurboTax will mail you an acknowledgement. And, when the IRS accepts the return, you will get a message say it was accepted. Yeah! Once I got a dreaded “not accepted” message, and that year they required I mail in the return. TurboTax Home & Business 2018 Disc includes 5 free Federal e-files and one state download. For more information, or to order, visit Amazon.com. It currently costs $79 with free shipping for the PC/MAC Disc. If you started a Youtube channel and want to get help and advice on the "howtos" of running your channel, then subsribe to my channel, Cyber Times LLC where I have a new series entitled Youtube Creators Help Forum. If you like to see the current episodes, visit my channel, Youtube channel, Cyber Times LLC with this link and subscribe.